We recently adopted a puppy. From day one, he’s had a mouthing and biting problem. Of course we know that when puppies play, they bite. Puppies use their mouths to explore the world. It is as normal for them to bite as it is for them to eat or sleep. It is through puppy play, which includes nipping, mouthing and biting that they eventually learn to control their biting instinct. 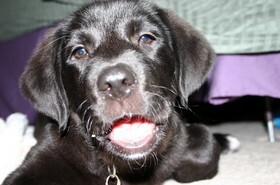 However, allowing a puppy to bite anything other than a toy or his food, is asking for trouble with a capital T! A puppy that bites will grow into an adult dog that bites and that will become a nightmare for both you and your adult dog. Be sure your puppy has lots of chew toys. This will allow him to vent his biting instinct. If he bites you, be sure to let him know his behavior is unacceptable. How do that: If the puppy bites when you’re playing with him or petting him, stop all interaction immediately and leave the room. If he cries, ignore him. Don’t talk to him or look at him. This will send him a message that what he did was wrong and he will realize that when he bites he doesn’t get your attention. Since puppies like attention and want to please you, the biting will soon be under control — as long as you’re consistent! In order for your puppy to accept you as leader of the pack, he must trust and respect you. To earn his respect, you should never hit, slap or kick your puppy for any reason. Instead, if you need to calm him down, just wrap him in a towel or blanket with only his head showing and cradle him to your chest until he is calm. This teaches him to chill. For your puppy to respect you as the leader, it must always be clear that he is at the bottom of your family “pack.” You and other adults should be the leaders of the pack. Children should come next, followed by any other animals that already live with you. It must be clear — to everyone in the home and your puppy — that the new puppy is at the bottom in terms of doggie rank. Why? If you don’t take the role of leader, then your puppy will! Not only will he be an unruly puppy, but he will also grow into a disobedient and aggressive dog. One way to demonstrate that you’re the leader: Always be the one to initiate play with your puppy. 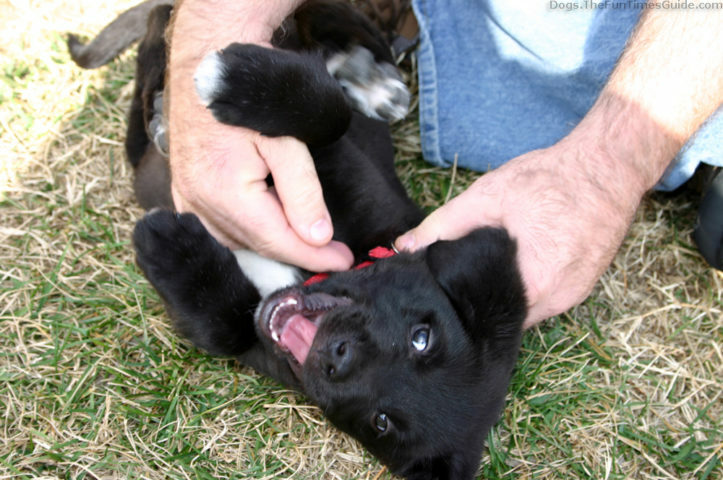 When you’re playing together, if your puppy begins to play rough or bite, you need to end play immediately. Leave the room and ignore the puppy completely. Leave him in a confined area by himself and allow him to calm down — approximately 2 to 3 minutes. Then, return to the room and if your puppy continues to play rough or bite, isolate him again. Continue this until your puppy realizes that you will leave if he doesn’t behave. He’ll soon get the idea. 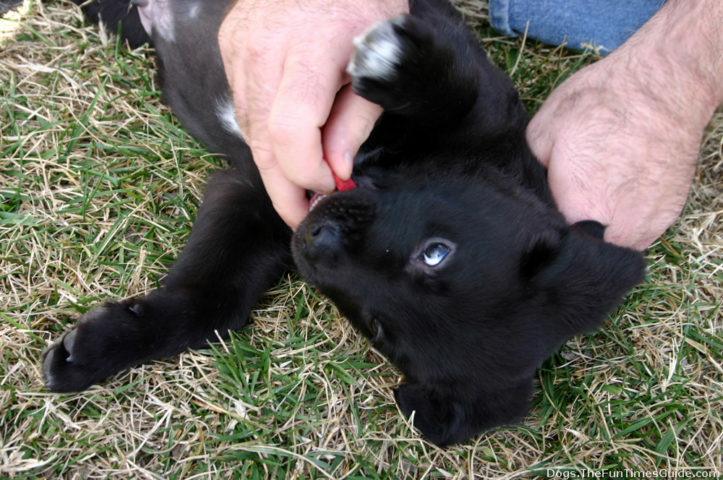 If your puppy is aggressive, avoid playing tug-of-war and other rough games. Instead, play fetch with a ball or chew toy. It is also unacceptable for your puppy to bite if you are feeding him by hand. Teach your puppy to sit whenever food is being offered. Try this: hold the food between your thumb and your index finger and move your hand toward your puppy with the palm toward your body. When the puppy puts his nose on the back of your hand, turn it so the food becomes available. As you are doing this, say, “Gentle,” in a soothing voice and allow your puppy to take the food. If he bites you, give a loud, “Ouch!” If he were biting another puppy too hard, it would yelp. Your puppy will see the “Ouch!” as a yelp and know he is hurting you. This often curbs the biting. If your puppy bites, isolate him and ignore his cries for attention. This method must be both consistent and repetitive. On the other hand, if your puppy licks you or plays without biting, be sure to praise him. He will soon decipher how to get and keep your attention. If, after you yelp and ignore him, your puppy continues to aggressively bite, you might want to consider purchasing a Gentle Leader. Adjust it to properly fit your puppy, then attach a leash to it. When your puppy bites, pop the leash quickly and firmly. At the same time, give a command such as, “Off.” Your puppy will soon realize that this particular behavior is unacceptable. If all else fails, it’s time to enroll your puppy in an obedience training class. This is just as important for you as it is for the puppy. It will teach you how to properly handle your puppy in a variety of situations, and it will teach the puppy proper socialization skills. Your puppy must be taught how to act around people and other dogs. Obedience training will ensure that you and your puppy will enjoy many happy years together. A well behaved puppy turns into a well behaved adult dog. Don’t let those beautiful brown eyes (or blue, green or gold) con you into giving in to your puppy’s every whim. If you let him get away with too much, he will not learn discipline and self-control. Nor will he learn to respect you. He will be out of control and you will have big trouble on your hands. Remember, he is not always going to be puppy-sized! Finally, be sure that your puppy gets lots of exercise. Take him for long walks, or take him to an off-leash dog park where he can run to his heart’s content and play hard. If taking your dog to the dog park isn’t convenient, then buy a long lead, attach it to his Gentle Leader and take him to a neighborhood park and let him run. Exercise is a great deterrent for an active puppy.